Tri-Village is currently seeking qualified individuals for a head junior high football coaching position and a varsity football assistant position. Please contact Head Coach Robert Burk at robert_burk@tri-village.k12.oh.us if you are interested in either of these positions. The 16th Annual Ohio Youth Basketball School Team State Championships will held Feb. 23 and 24 in Columbus for Boys and Girls teams in the 3rd thru 6th grade. Three different divisions in each grade based on school size. Over 150 Teams are expected to compete. For more information on this and other OYB events go to www.ohioyouthbasketball.com or call 740-808-0380. 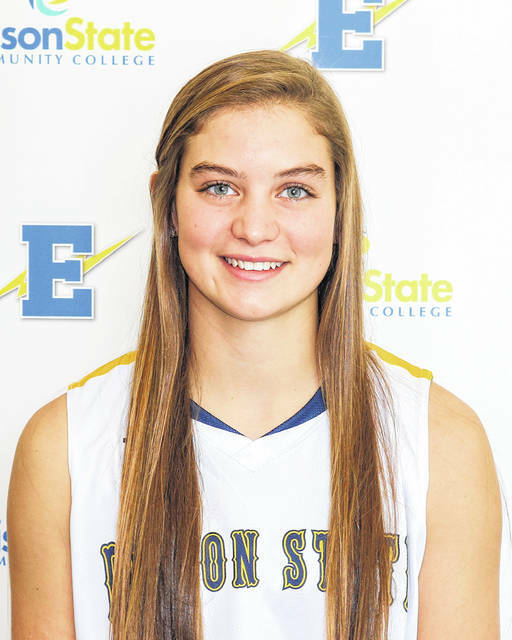 The Ohio Community College Athletic Association (OCCAC) has named Edison State Community College sophomore Clair Schmitmeyer of Versailles the National Junior College Athletic Association (NJCAA) Division II Women’s Basketball Player of the Week for Jan. 28 to Feb. 3. Schmitmeyer did a little bit of everything in a busy week for the Chargers, posting per game averages of 12.3 points, 7.3 rebounds, 5.0 steals and 4.3 assists in a total of 98 minutes spanning three contests. Schmitmeyer is now the owner of four OCCAC weekly awards in her career, three coming from this season. Schmitmeyer is averaging 12.8 points, 8.9 rebounds, 3.5 assists and 3.3 steals per game in her second season at Edison State (17-4, 6-3 OCCAC). ASHLAND – Kara Hollinger of New Madison, Ohio is a member of the women’s club volleyball team at Ashland University. Hollinger is majoring in integrated language arts. She is the daughter of Doug and Amy Hollinger of New Madison. Hollinger is a 2018 graduate of Tri-Village High School.